In major central cities, minority businesses are more likely than non-minority businesses to locate in high poverty areas. This enhances economic opportunity and revitalization of some of the nation’s most distressed urban communities. Globalization and economic restructuring have placed minority communities in a vicious circle of concentrated poverty and inequality as many traditional jobs occupied by low skilled minority workers have disappeared altogether, or have relocated away from inner city minority communities. But a study EuQuant which powers the Gazelle Index entitled, Increasing the Capacity of the Nation’s Small Disadvantaged Businesses found that minority business development is a counter-weight to this tendency of inner city disinvestment. In a study of over 43,000 small business government contractors, EuQuant found that that 31% of minority businesses are located in high poverty areas of large central cities. High poverty areas were defined as census tracts where 20% or greater of the population lives in poverty. In contrast, 24% of the businesses owned by non-minority persons were located in high poverty areas. The concentration of minority businesses in low income areas was highest in Baltimore (69%) and Philadelphia (60%) and lowest in Chicago (17%) and Atlanta (18%). Not only were minority business owners more likely to locate high skilled and low skilled enterprises in high poverty areas, Blacks and Hispanic business owners tended to locate their business in neighborhoods that had high concentrations of their own ethnic group. See the table below. It shows that black businesses are located in neighborhoods where the racial composition is 44% black on average. 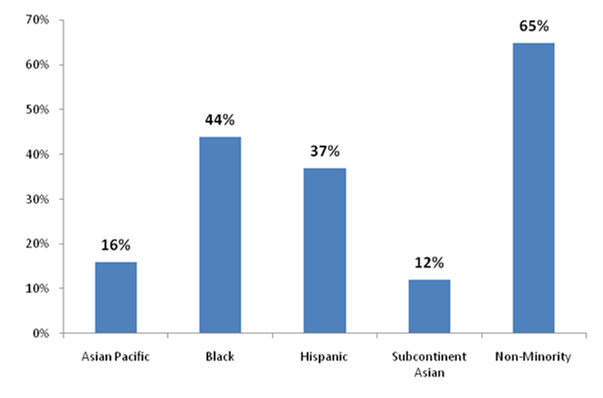 Similarly, Hispanic Business Owners are located in neighborhoods that are 37% Hispanic. Given the disproportionately high unemployment and poverty among Blacks and Hispanics, the location and employment patterns of their businesses represent a valuable resource for restoring the nation’s economic well-being; especially in distressed communities.